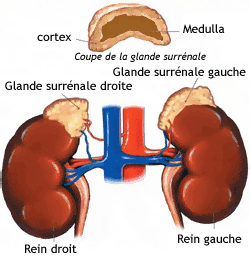 Above each individual’s kidney lies the small, pyramid-shaped adrenal gland. These two parts of the gland produce different hormones that are essential for life. The adrenal medulla produces mostly adrenaline and noradrenaline. The adrenal cortex secretes androgens (e.g. testosterone, DHEA), mineralocorticoids (e.g. aldosterone) and glucocorticoids. The main glucocorticoid hormone secreted by the adrenal glands is called cortisol (or hydrocortisone). This hormone plays a crucial role in the regulation of major body functions (glycemic metabolism, immune system, inflammation). Given the importance of these functions in everyday life, cortisone is a vital product of the human body. The general public and physicians commonly refer to these “synthetic glucocorticoids” as “steroids” or “cortisone”. Corticosteroids are steroidal anti-inflammatories as opposed to “classic” anti-inflammatories such as ibuprofen, naproxen, diclofenac or aspirin which are themselves non steroidal anti-inflammatory drugs.